Seventeen-year-old Bonnie(TM) Baker has grown up on TV--she and her twelve siblings are the stars of one-time hit reality show Baker's Dozen. Since the show's cancellation, Bonnie(TM) has tried to live a normal life, under the radar and out of the spotlight. But it's about to fall apart . . . because Baker's Dozen is going back on the air. Bonnie(TM)'s mom and the show's producers won't let her quit and soon the life that she has so carefully built for herself, with real friends (and maybe even a real boyfriend), is in danger of being destroyed by the show. Bonnie(TM) needs to do something drastic if her life is ever going to be her own--even if it means being more exposed than ever before. 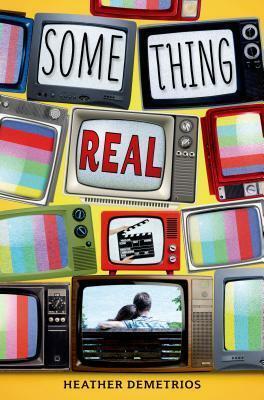 Heather Demetrios' Something Real is the winner of the Susan P. Bloom PEN New England Discovery Award. When she's not traipsing around the world or spending time in imaginary places, Heather Demetrios lives with her husband in New York City. Originally from Los Angeles, she now calls the east coast home. Heather is part of the Summer 2014 Writing for Children and Young Adults MFA class at Vermont College of Fine Arts and is a recipient of the Susan P. Bloom PEN New England Discovery Award for Something Real. She's never been on reality TV, but her grandmother keeps begging her to do The Amazing Race.